Art DeTour 4: Fountain City Art | Oh, the Places We See . 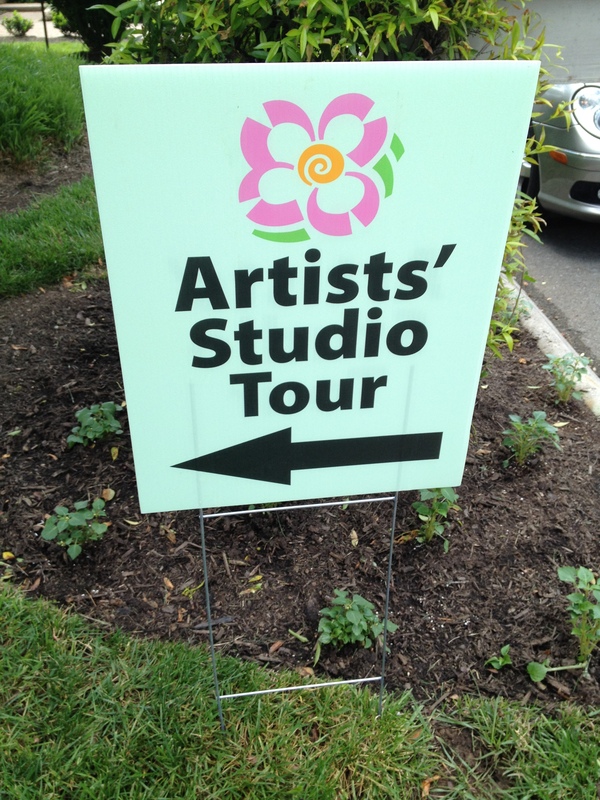 . .
Not all of the Dogwood Arts Festival Art DeTours are held in the homes and studios of artists. 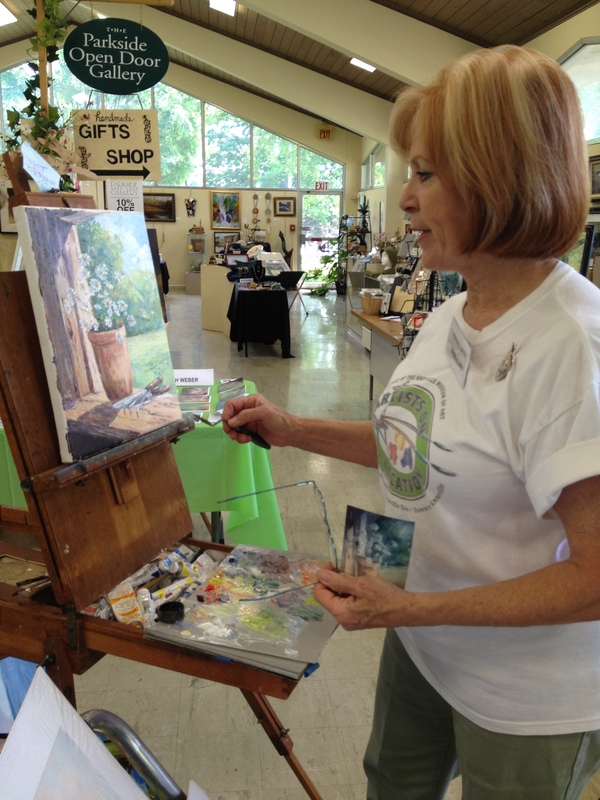 The Fountain City Art Center — about a block past the Duck Pond on Hotel Avenue in Knoxville– opened its doors, too, so visitors could take a closer look at some of the Art Guild members at work! My husband and I found artists standing at easels, paintbrushes in hand — backing up then leaning in — squinting at art in progress. 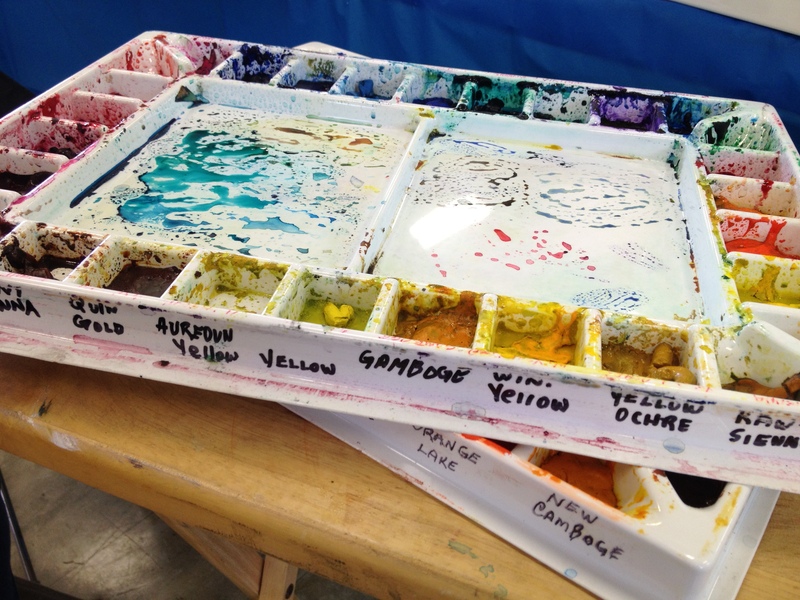 Others sat with palettes beside them — dabbing, mixing, wiping — blending pigments for just the right shade. Aurora Bull was touching up a painting of yellow flowers begun some time ago to breathe new life into it. Sylvia Williams, too, was revisiting a painting she had begun for a friend. 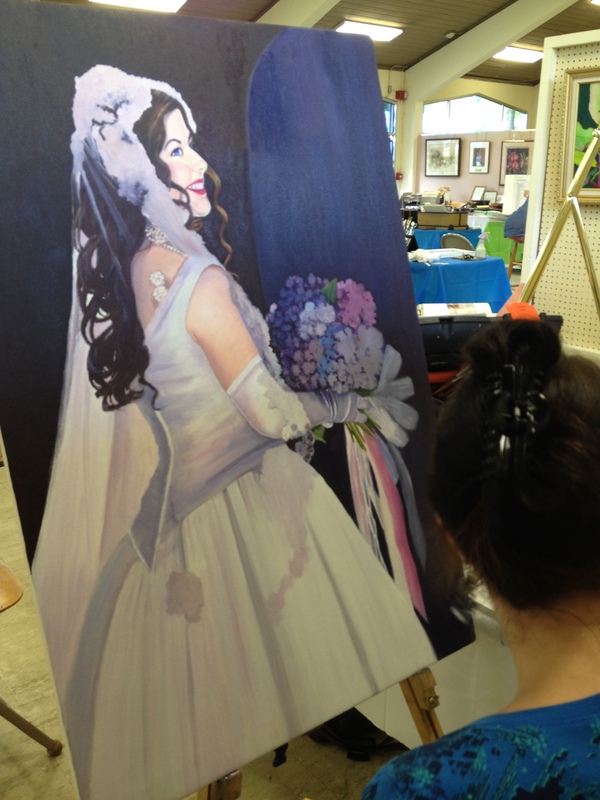 Although the wedding date has come and gone, she still wants to honor the bride in her fashionable gown with a portrait contrasted by a deep, almost-navy background. 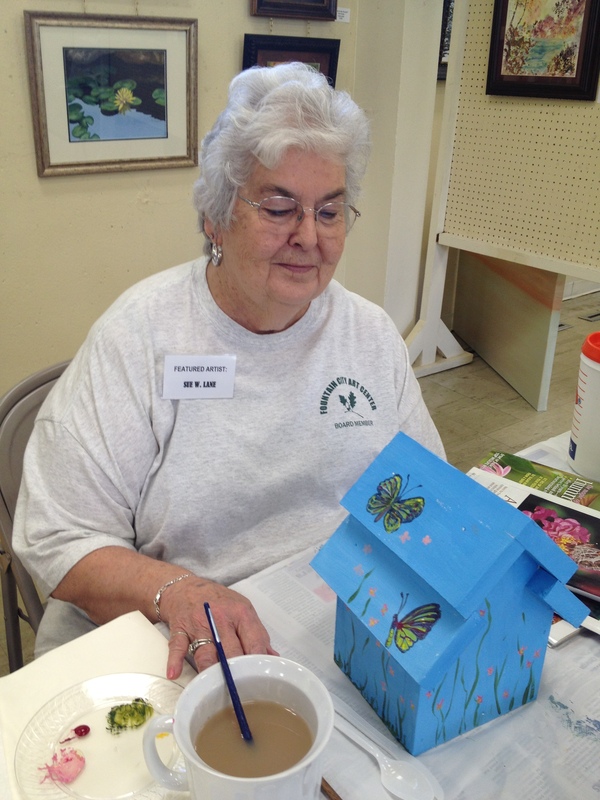 A birdhouse got Sue Lane’s attention — and there were plenty more just around the partition in the Center! 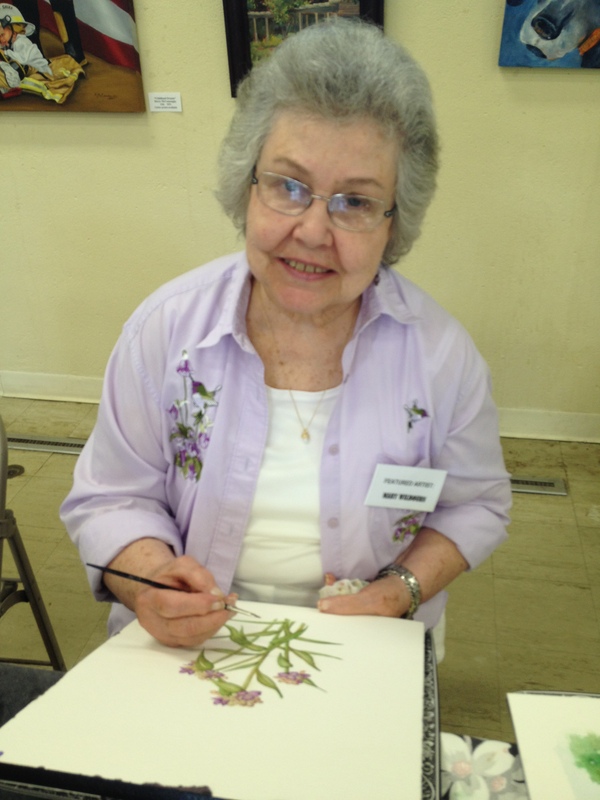 Soft colors comprised the work of Mary Wilbourn — suitable for songbirds and dogwood notecards. Sarah Weber dabbed shades of brown to make river rocks come to life. While we were there, she helped Mother Nature along by adding one more rock in the lower left corner — a solid base for a mountain stream. Trays of paints took on a life of their own for Christine Harness who told me she had named a tray Anne Abbott. Anne Abbott? I asked. Isn’t she a teacher at Fulton? Christine later commented, My trays are named after people I know and admire. 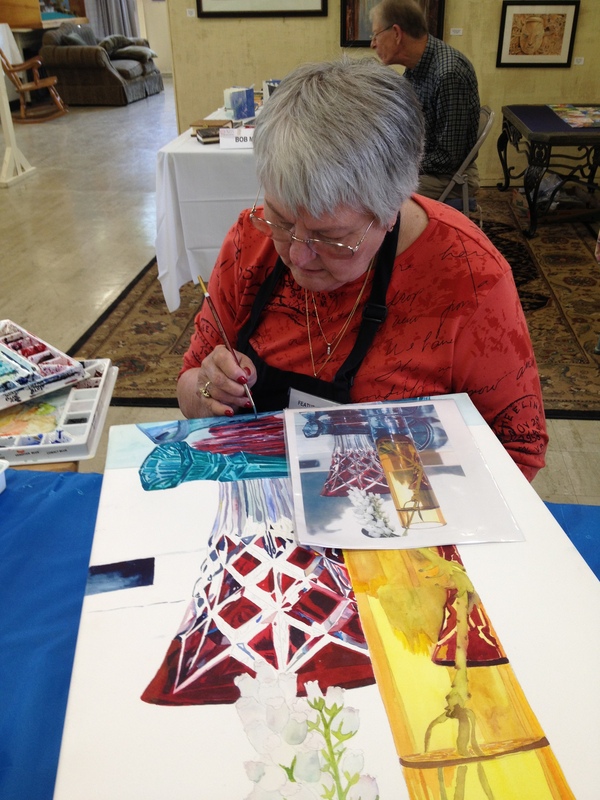 Anne Abbott is a national artist that has workshops. 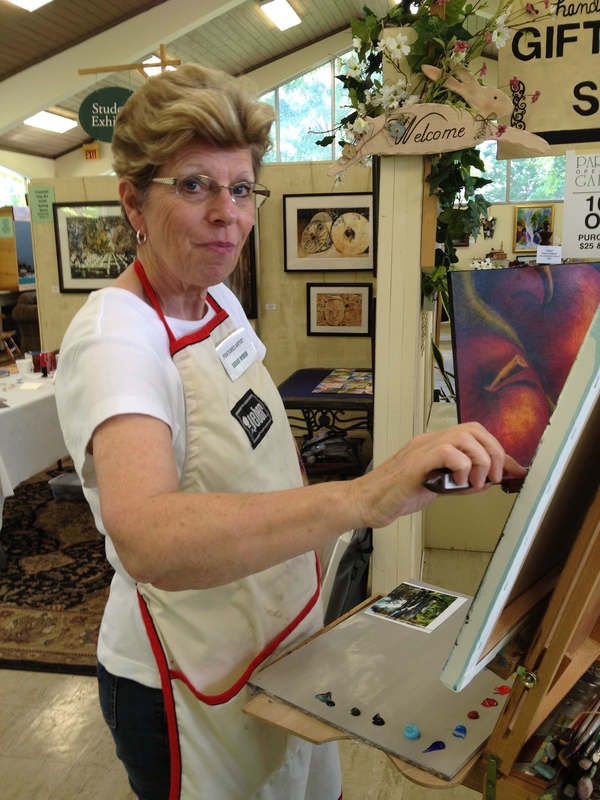 I did her workshop with the Tellico Village art guild. 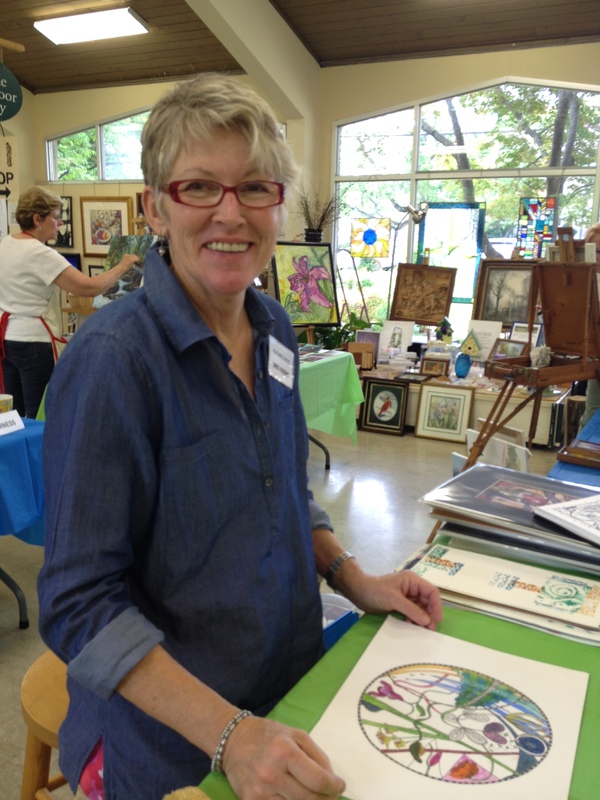 The Anne Abbott I know is creative, too — an English teacher I admire! We admired Christine — for attending to the detail of a finely cut water goblet — larger than life. And glistening! 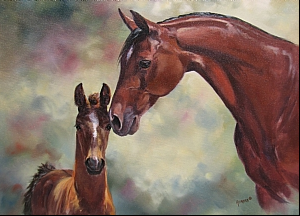 We loved the fanciful, almost childlike quality of Doris Prichard’s framed piece submitted for the Members Show . . .
and we liked Doris, too — a little fanciful herself! 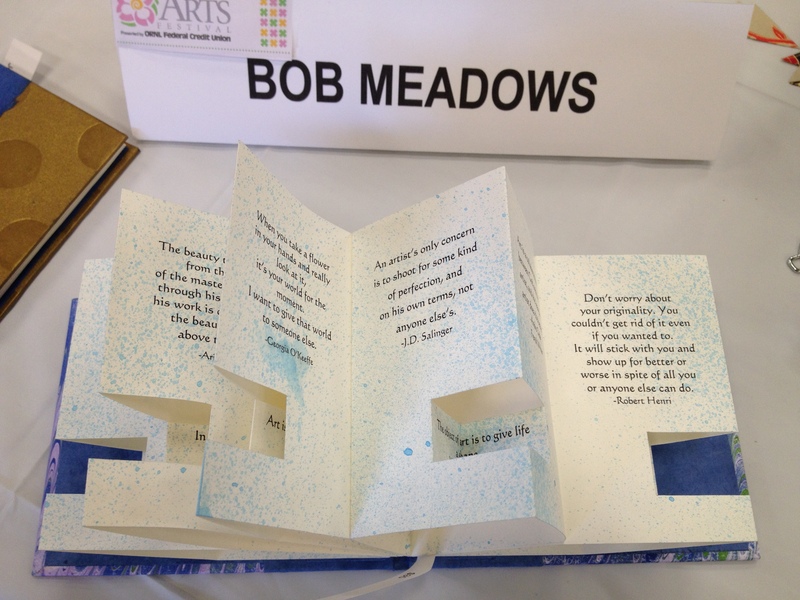 These AMAZING hand-crafted books by Bob Meadows caused us to do a double-take. 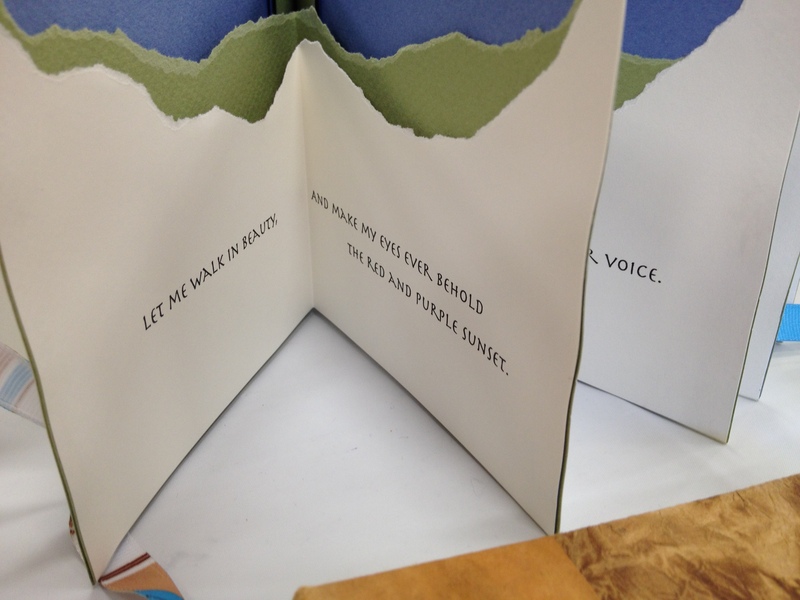 . .
not just for the cut-outs, torn paper edges, and bindings . . . but also for the poetic passages that drew us right in. 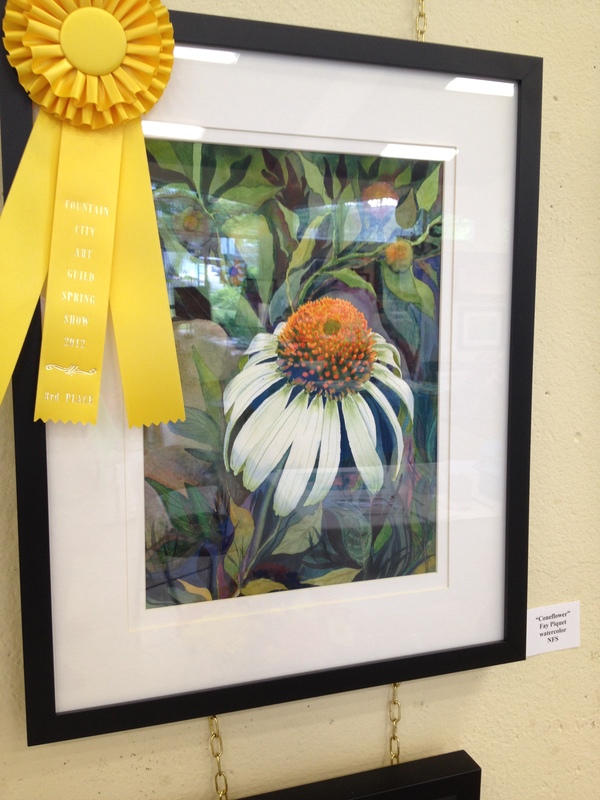 Although Fay Piquet wasn’t painting with her fellow artists on the day of the DeTour, we couldn’t resist snapping a picture of her award-winning watercolor, Coneflower. 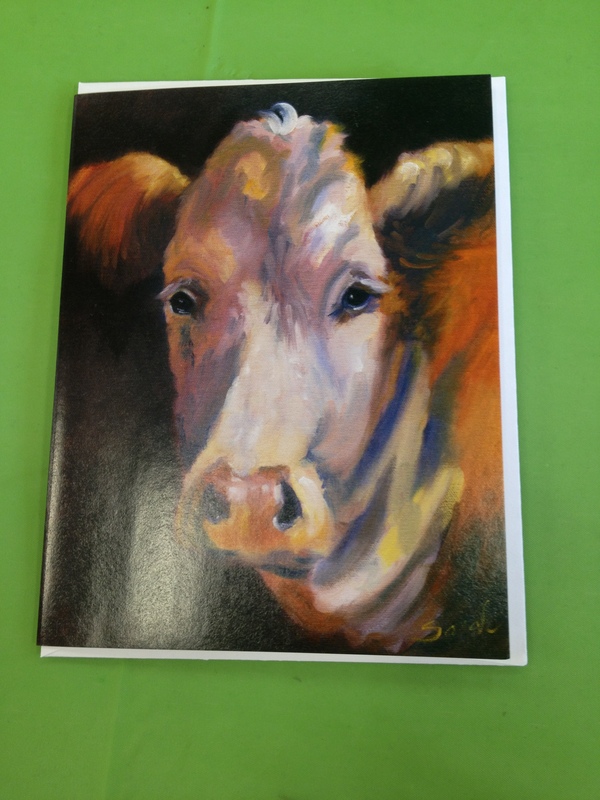 And my had-to-have little takeaway: Emie Sue — a carefully, colorfully brush-stroked cow by Sarah B. Weber! Treasures lie in wait at the Fountain City Art Center. So, we’ll be back! Just as we hope you’ll return to Oh the Places We See for our last two Art DeTours! 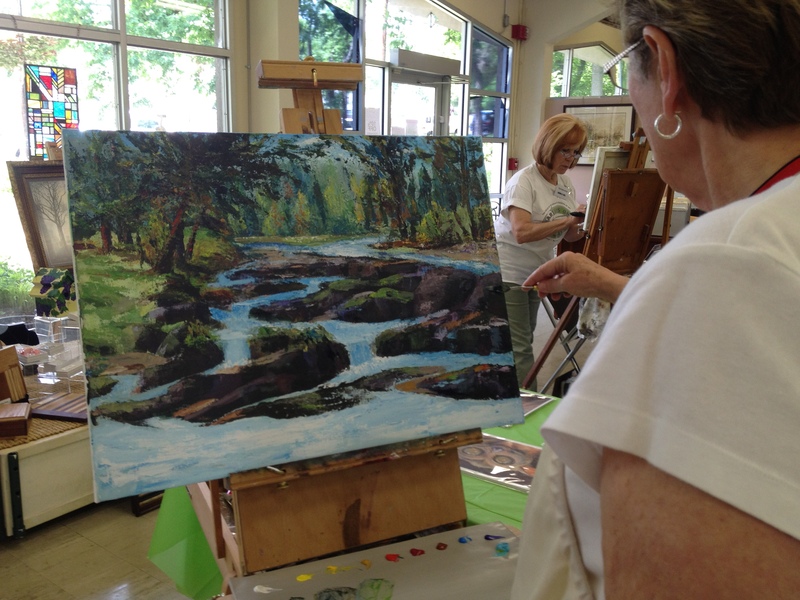 Oh, what Knoxville artists can do! 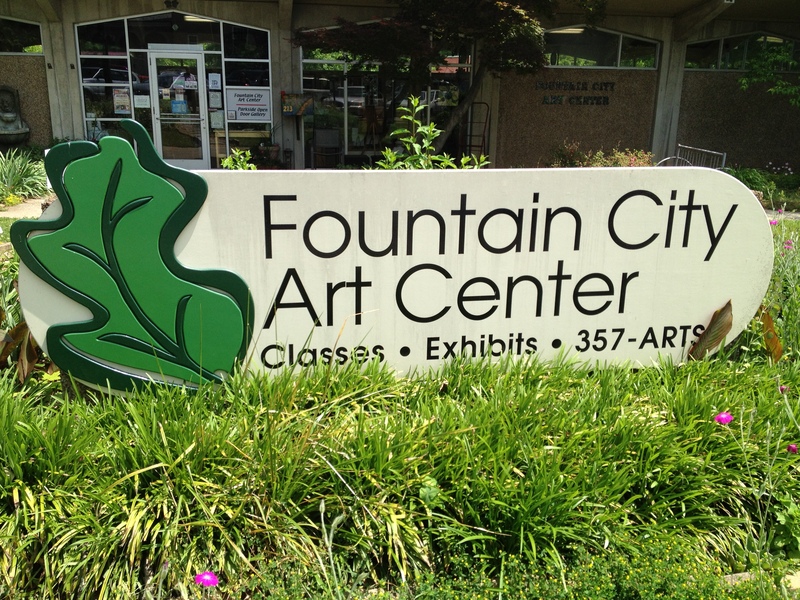 Fountain City Art Center, Inc. 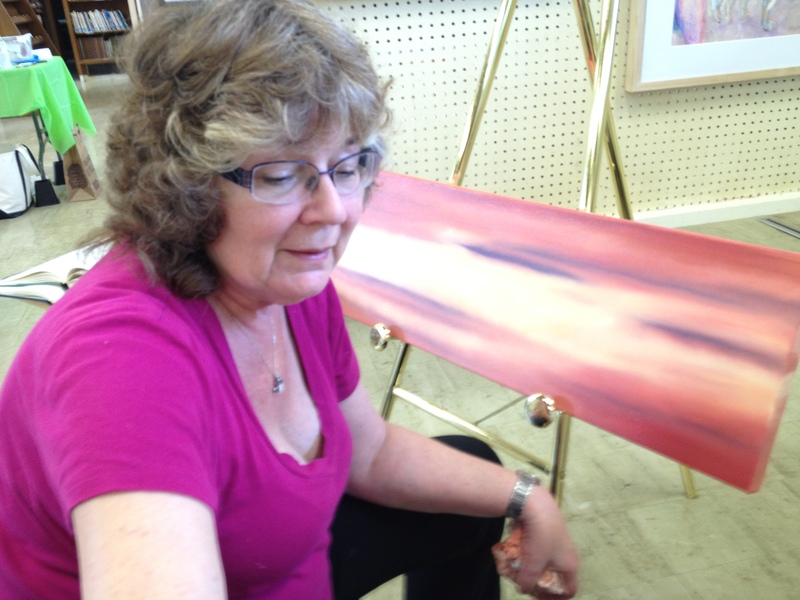 This entry was posted in Travel and tagged art, Dogwood Arts, Knoxville. Bookmark the permalink. Anne Abbott is not a teacher at Fulton. 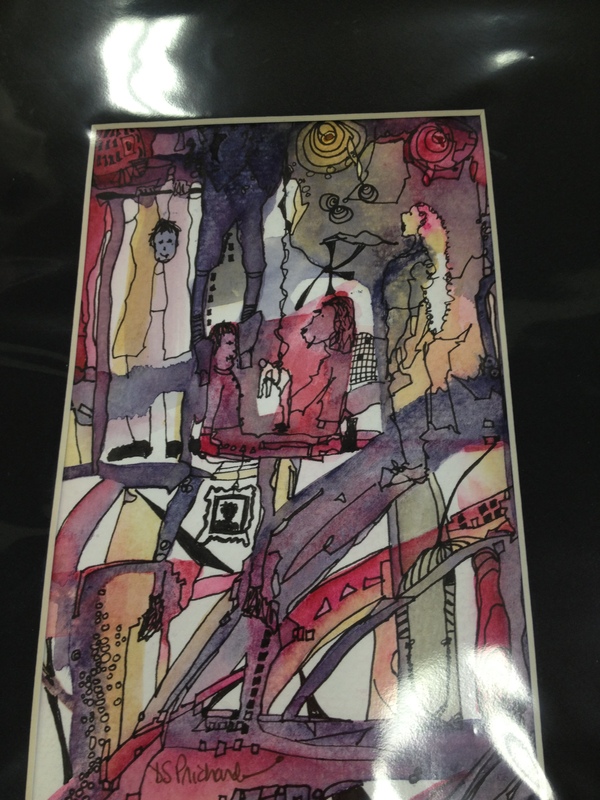 She is a national artist that has workshops. 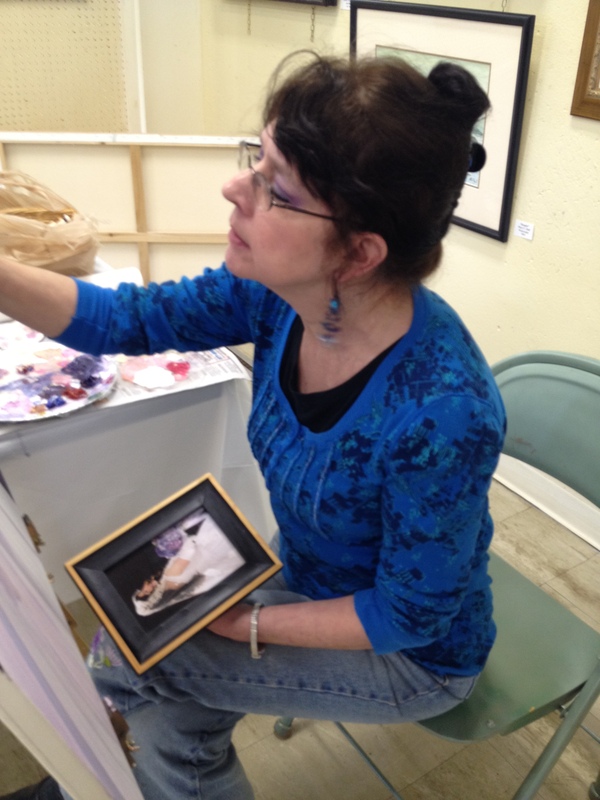 I did her workshop with the Tellico Village art guild. Thank you for the article, as a FCAC board member I appreciate all the publicity for the Art Center. We are proud of everyone who has worked so hard since 2004 to bring Art to the Fountain City area. This was something we needed in The North part of Knoxville. Art is alive and I want to thank you for everything you have done. We need all the support we can get. Jan, you’ve made my day! 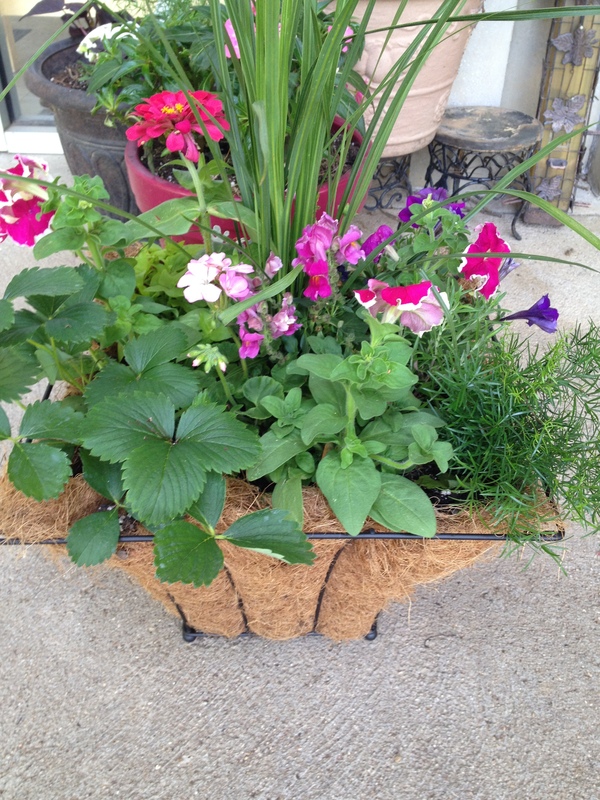 Thanks for reading the blog and taking the time to comment! Come back this week for my last Art DeTour: Bill Cook and Suzanne Jack!